Forming the eastern side of the small square at the eastern end of St Vitus Cathedral is the Basilica of St George. It is the oldest surviving church at Prague Castle apart from the remains of Bořivoj’s Chapel of Our Lady, under what is now the Castle Picture Gallery, and the older parts of St Vitus Cathedral. 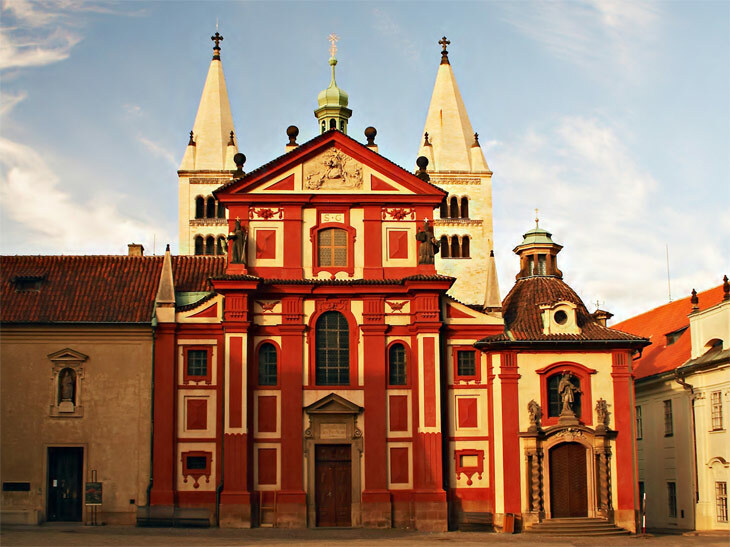 The church was founded in 920 by Prince Vratislav and around five years later the remains of Princess Ludmila, the first Bohemian martyr and the grandmother of St Wenceslas, were brought there. The current form of the church, a basilica with twin steeples, is the result of restoration and alterations after a fire broke out in 1142. The basilica was damaged by fire again in 1541 and underwent alterations in the Renaissance style. Later, as with many medieval churches in Prague, it was partially remodelled in the Baroque style, and the west façade, in striking colours, was built between 1671 and 1691. Between 1897 and 1907 the Romanesque appearance of the basilica was restored during renovations. The interior contains the tombs of Prince Vratislav, the founder of the basilica, and Prince Boleslav II. St, Ludmila is buried in the adjoining fourteenth-century Gothic chapel of the same name. The southern side of the church features an Early Renaissance doorway (circa 1500) and a copy of a Late Gothic relief of St George. The Chapel of St John Nepomuk was added to the southern side by František Maxmilián Kaňka between 1718 and 1722, and the façade features a statue of the saint by Ferdinand Maximilián Brokoff. The basilica is open to the public.